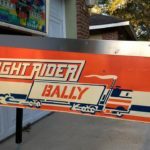 About a week ago, this 1976 Bally Night Rider was dropped off in need of some TLC. It was very dirty, a little rusty, and wouldn’t start a game. 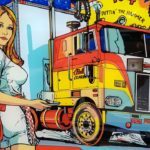 I have worked on many EM’s in the past and was definitely up for the task to get this game back up and running and playing the way it should. Below is the list of everything that was done to the game. It’s a long list, but I “Put the hammer down!”, as they say. – Cleaned and adjusted the following relays and units: Game Over Relay, Coin Relay, Lock Relay, Reset Relay, Ball Index Relay, Bonus Score Relay, Player Reset Relay, Top Hole Unit, Player Up Unit, Credit Unit, Bonus Unit, Double Bonus Relay, Ball Count Unit, Scoring Motor #3 stack of switches. 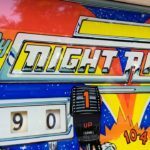 – Adjusted 10 Thousand “Over the Top” switch on player reels 1-4. – Installed new drop targets, cleaned and adjusted all drop target switches and mechs. 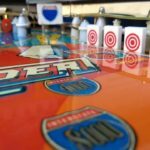 – Replaced all playfield posts. 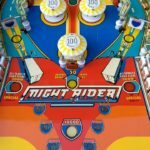 – Replaced all playfield rubber. 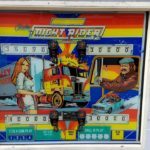 – Cleaned and polished playfield. 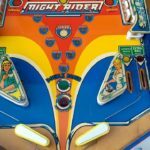 – Cleaned and polished playfield plastics. 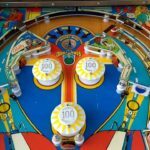 – Cleaned and polished playfield screws. – Installed nickel plated acron nuts. – Cleaned and polished shooter rod. – Cleaned and polished shooter rod housing. 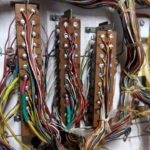 – Cleaned and adjusted flipper switches. – Cleaned and regrained coin door. – Regrained lockdown bar and siderails. – Removed rust and repainted backglass lift channel. 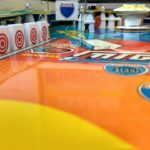 – Cleaned all plastic scoring reels. – Cleaned Credit Unit disc. – Replaced all pop bumper bodies, skirts, caps and lamp sockets. 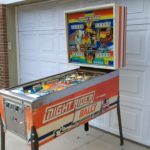 – Replaced left side coin door lamp socket. – Rewired coin door switches. 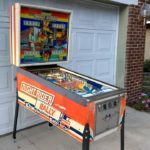 – Installed flipper rebuild kit. 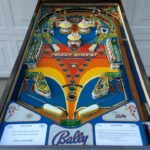 – Installed Bally coin door decal. 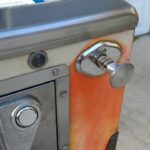 – Installed new coin door and back box lock. – Replaced new Bally gun metal legs, levelers and leg bolts. – Replaced shooter spring and shooter barrel spring. 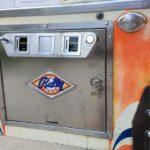 – Installed missing plum bob for tilt unit. – Replaced all 132 bulbs and cleaned sockets where needed. – Replaced main fuse block, secondary fuse and playfield fuse holders. 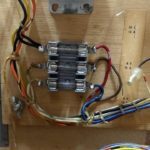 – Repaired back box connector wire hacks. 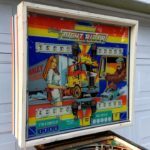 – Repaired/Glued rear bottom of cabinet. – Repaired/Glued front right edge of cabinet. – Vacuumed inside of game. All the scoring reels were cleaned. This shooter housing was all brown and rusty. It has been cleaned up along with the shooter rod. A new barrel spring installed. Coin door cleaned up as best as possible with new decal. 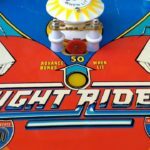 This playfield buffed out nicely with a good shine. You can see the reflection of the new drop targets. Wire hacks eliminated and connectors cleaned. Here’s a cleaned relay. Now you can see the brass contacts again. 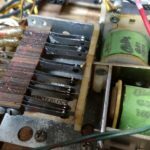 All the original fuses were bypassed with wire hacks. This new fuse block makes this game safe again. 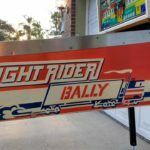 This entry was posted in Repairs, Mods & Shop Outs and tagged bally, em, night rider, Pinball, repair, tampa by Pinball Shark. Bookmark the permalink.